As mentioned yesterday on Luke's sister's blog www.alycesworld.me the kids of the family had their checkups at the doctors office. Luke's checkup went fairly well. He endured all of the poking and prodding of the doctor without out making too much of a fuss. By the time the doctor finally came in he was well past his nap time so anything less of a meltdown would have been considered a good trip. Luke's dimensions still exceed statistical limits but the 100th percentile is catching up to him. If he were to continue his weight gain trend from now to 9 months he would weight roughly 26 lbs. This would put him in the 95th percentile in weight for children that age. I think his earlier weight gain was a statistical anomaly and that like his sister he will soon be within normal bounds. Developmentally he is right on track for where he should be. Luke is starting to roll over, sit up when supported, and is able to pass items from one hand to another. The doc said that we could start introducing more foods to him including fruits and vegetables to with a new one being added every few days. The only complication to the checkup is that the doctor noticed some wheezing in Luke's lower lungs. This is due to the cold that he has for the past two weeks. Eventually his body will clear out the infection and get rid of the junk down below but until that point we have to give Luke some Albuterol treatments. Albuterol is a drug that most Asthma patients use to dilate their bronchial tubes during an Asthma attack. The same properties would be helpful for Luke to open up his lower lungs and help move the infection out. The procedure to get him this medication is time consuming. We have to take the substance that is a liquid, put it in a machine, the machine vaporizes it, and Luke breathes in the vapors. The treatment takes about 20 minutes in which we have to keep this tube in front of Luke's nose and mouth. Kind of hard with a 6 month old. 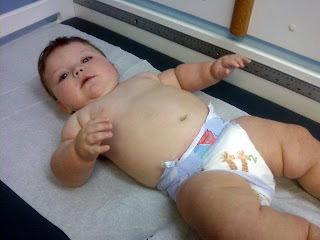 Luke needed a few injections with the checkup including the seasonal flu vaccine. He didn't complain too much about the injections and afterward he fell asleep on the way out to the car. Update: I forgot to comment on one item. We asked the doctor about Luke's night terrors and she carried the same opinion that Luke was having a night terror. She also confirmed our course of action which is to go in and check on him, but not to wake him up and let his mind get through to the next stage in his sleep cycle on its own..